Olá! I'm Rafa and I will guide you to learn Portuguese quickly! You may have come to this site because you want to learn Portuguese. Or you may be searching for a specific topic relating to Portuguese culture or perhaps just a useful Portuguese phrase. Maybe you are looking for a Portuguese Teacher, or for advice about how to do, set up and expand your business in Brazil, Portugal, Angola or any other Portuguese speaking country. You may also have come to this site because you realize that when you arrive in Portugal, Brazil, Angola, Mozambique, A Guiné, S. Tomé, Cape Verde, East Timor, Madeira or the Azores, you will need to speak the local language. You may also need to know about the people and their culture. This site and the materials suggested here aim to teach you how to learn Portuguese, what to listen for, and what to say in Portuguese speaking countries, and to understand what Portuguese native speakers are saying to you. All this combined with useful tips to help you better understand the locals' culture too. By using these ideas and by being aware of what to remember when you want to speak Portuguese, you will learn to control and manage everyday situations with such ease that the locals will be impressed with how well a foreigner is able to communicate with them. With just a few words of Portuguese you will open the doors of communication and establish rapport. In this site, your opinion is important. So you can vote and/or suggest a topic that you'd like to learn by clicking here. Now and then, I'll suggest 4 topics and the one that wins will be added to the site. Did you know that you will only need to learn about 300 words to sustain a conversation? Obviously combined with a good method? Those Portuguese words and that method are here for you. If you follow my recommendations you'll be learning each item in a way that you'll hardly forget again. You have chosen the right way to make your visit go smoothly. Every technique, word or expression you learn relates to real situations in Portuguese speaking countries. I know this site will change your mind about learning how to speak Portuguese and, armed with the confidence you will gain, you might choose to learn more and more. And, I'll be here looking forward to that day. I will be here to help you too! By the way, if you sign up for my newsletter in the box on the top right hand column, I will be in touch with you with the hottest explanations about Portuguese. Also, I have already launched a revolutionary way for you to learn Portuguese quickly and effortless. Please check out Rafa's Vocabulary Ticker now. 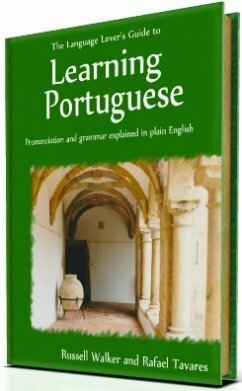 A brand new book - The Language Lover’s Guide To Learning Portuguese - is now available for you to guide you and help you understand and practice your Portuguese. This new creation has been written in cooperation with Russell Walker from learningportuguese.co.uk. Please click on the image and check it out. Your opinion and ideas about how you learn Portuguese are really important. So, please do not hesitate to contact me. I would love to know what you have to say. Please click on the Navigation Bar buttons to become familiar with what you need to know, to learn Portuguese - the 3rd European language most spoken in the world. 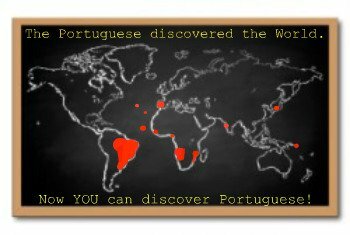 Check out the dots on the map to visualize where in the world you can speak Portuguese. To know how to learn Portuguese, understand the way your brain works first. Learn about the psychological barriers that holds you back when you try to learn Portuguese. Here you can learn the Portuguese word order and how to build sentences. Here you'll find the most recent updates of this site. Here I'll keep you posted. Don't worry! If you'd like to contact me with any comments or suggestions, please do so here. By knowing a little bit about myself and how I learn languages will inspire you to learn Portuguese with confidence. Disclaimer and Terms and Conditions - This site has been built in good faith. Here you'll understand how useful the portuguese personal Infinitive is and how to use it correctly. Overcome the mith of the Portuguese Present Subjunctive. Portuguese adverbs are words you use to express intensity place, quantity and so on. Learn them now and start speaking eloquently! The Future Subjunctive in Portuguese - Futuro do Conjuntivo/Subjuntivo. Unsderstand how to use the Future Subjunctive in Portuguese. It's easy! Find out how here. The subtle difference between Onde and Aonde in Portuguese.